19 people attended the two workshops. Upon arriving, each attendee was asked to identify on a map, generally, where they live or work in Marana. This was done to see what areas of the town were represented in the workshop results. Attendees at the December 12th workshop were primarily from in Dove Mountain and Continental Ranch. Attendees at the December 13th workshop were largely located west of I-10. The workshop began with a short presentation informing attendees of the status of the General Plan Update, as well as an overview of the Map Atlas. Participants then split into groups to complete two exercises focused on transportation infrastructure and future development. The exercises and results are described on the following pages. In the transportation planning exercise, each group of participants identified where transportation improvements in Marana should occur. Each group was provided a red marker and various colors of yarn used to represent different transportation improvements. With the red marker, participants identified future intersection improvements, overpasses / underpasses, and I-10 interchanges. Most improvements were identified near existing I-10 interchanges. A new overpass was identified across the Santa Cruz River near Airline Road and new I-10 interchanges were identified at Moore Road and Avra Valley Road eastward. Next, future roadway improvements and expansions were identified using one-inch pieces of orange yarn. Each inch of yarn represented one mile on the map. Most groups focused on roadway expansions connecting Dove Mountain Boulevard to I-10. Other expansions were noted at Avra Valley Road and Tangerine Road. Participants then replaced five of their orange yarn pieces with five one-inch red yarn pieces. The red yarn pieces indicate improvements that should be prioritized. There were mixed results with the red yard, including improvements to Tangerine Road, Twin Peaks Road, and Cortaro Road. Using yellow yarn, the groups identified new transit corridors throughout the town. 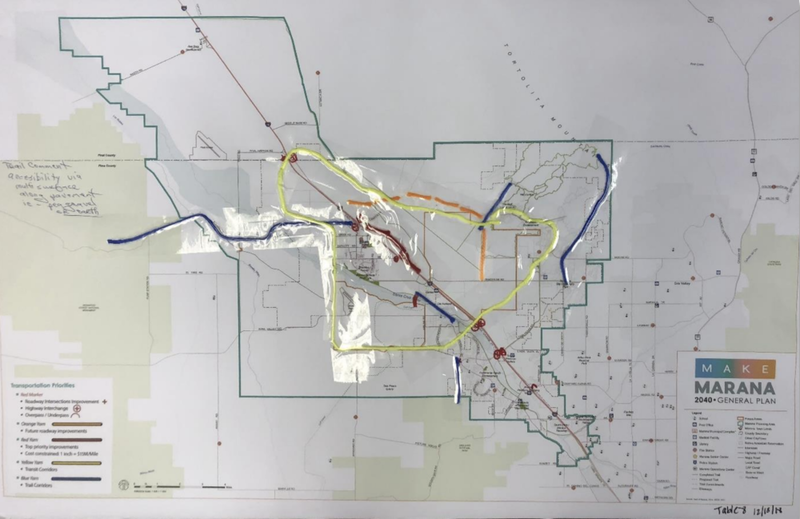 Most groups created a circulating transit system through Dove Mountain and connecting the Town Center area, Gladden Farms, and the Marana Regional Airport, as well as Bus Rapid Transit routes along I-10. Lastly, groups were provided blue yarn to locate future trail corridors. These were identified along Tangerine Road, along the Santa Cruz River, through Dove Mountain, and connections into the Saguaro National Park and Ironwood National Monument. Photos of the complete Transportation Planning exercise results are shown on the following pages. The quantity of bricks was based on future growth projections and assumptions for Marana. Residential bricks were able to be swapped for an equal number of dwelling units. Additionally, four yellow flowers could be swapped for a green brick representing a community recreational facility. Groups were asked to plan where each brick should be placed within the focus areas. Participants were allowed to stack bricks to increase density and intensity of uses, as well as draw future roadway connections to their envisioned developments. Following is a summary of each groups’ results. Group 1 envisioned development on the north side of I-10 near Tangerine Road. The area was comprised of commercial along the highway corridor, high density residential next to the commercial, and then lower density residential further removed from the interstate. A community recreational facility was placed along Tangerine Road placed next to commercial and high density residential . Employment bricks and a commercial brick were placed near the Marana Regional Airport, envisioning this area as an employment hub. Participants in Group 2 focused most of their commercial uses along Tangerine Road east of I-10. Most residential uses are located in the Tangerine Corridor Focus Area, transitioning from higher densities nearest to I-10 to lower densities westward near Dove Mountain. This group also clustered development east of the Marana Regional Airport with a mix of employment, commercial, and medium to high density residential uses, as well as a community recreational facility. Group 3 scattered developments across the two focus areas, with the most clustered activity located along Avra Valley Road east of the Marana Regional Airport. This area features a mixed-use center with employment uses nearest to the airport. The Tangerine Corridor Focus Area contains clusters of medium- to low-density residential subdivisions north of Tangerine Road, near the Moore Road alignment. There are three individual mixed-use centers spread through the focus area, as well as a community recreational facility. Group 4 created a commercial district east of the Marana Regional Airport, along with a community park. Additionally, this group created a high-density activity hub in the Tangerine Corridor Focus Area, with the highest densities and intensities of uses near the Tangerine Road / I-10 interchange. This cluster of development features two high-intensity commercial districts, a community recreational facility, and three community parks intertwined with high-density and medium-density residential districts within a mile radius of each other. Residential densities decrease as they get farther away from the activity hub.